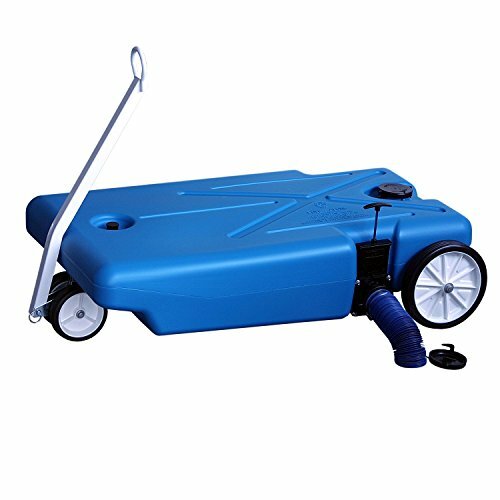 This hand-towable model has four wheels and is made from hardy molded polyethylene, steel, and aluminum. Each portable holding tank comes equipped with standard 3-inch valves so you won’t need to lift the tote to empty the tank. This unit also comes with a 2-year warranty. The Barker tote arrives fully assembled and includes bayonet fittings, 5-foot sewer hose, and a tow handle. This unit measures 46 inches long, 24 inches wide, and 11.5 inches tall. When empty, this tank weighs in at 37 pounds and has the capacity to hold 32 gallons. The double-wheeled front swivel design makes this tank exceptionally easy to maneuver. The rubber, air-filled tires ensure easy navigation even over rough terrain. A display gauge lets you know exactly how much space is left in your tank. This tank is quite heavy once full. Factor in any level changes and consider using ramps or emptying more frequently if needed. If you’re looking for a simple but reliable waste tank that won’t hurt your wallet, this 10-gallon capacity Barker tote is a great option. At only 11 pounds when empty, it’s also easy for anyone to lift or handle. This tank is ideal if you have limited space. At 30 inches long, 15 inches wide, and less than 9 inches tall, it fits virtually anywhere you need a portable waste tank. This product includes large, sturdy wheels that make towing easy. Bayonet fittings come standard with this model. A short hose is also included, which can be used when rinsing and cleaning out the tote. Unlike the larger Barker totes, this one comes with a molded handle. This helps keep the footprint down without compromising your ability to move it easily. Additional handles can be purchased if needed or you may prefer to transport it in another wagon with four wheels. Take care with this tote when traveling through extreme altitudes. When sealed, the tank may change shape and expand when exposed to altitude changes. This can dislodge the axle and make transport difficult. To avoid this, crack the valve a little bit to allow for air exchange when you’re traveling at altitude. 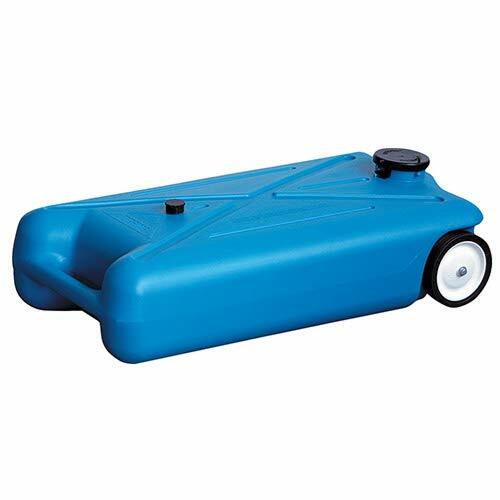 This large capacity Camco tank is heavy duty and comes ready to use, with everything you need. Large, durable tires help the tank move easily over any terrain, no matter where your adventures take you. The removable, steel towing adapter allows you to move the tank as you would a regular piece of luggage. It can also be towed (slowly) behind a larger moving vehicle, such as a 4-wheeler or a golf cart. Integrated ladder hooks enable the tank to hook easily to your RV ladder when it’s not in use. The tote tank actually features grooves to help you securely strap it in place. This way, you can worry less about the tank slipping out of its traveling position. The smooth interior is easy to clean out, with the help of the integrated tank rinser. The tank features gate valves which help make rinsing and cleaning easier. 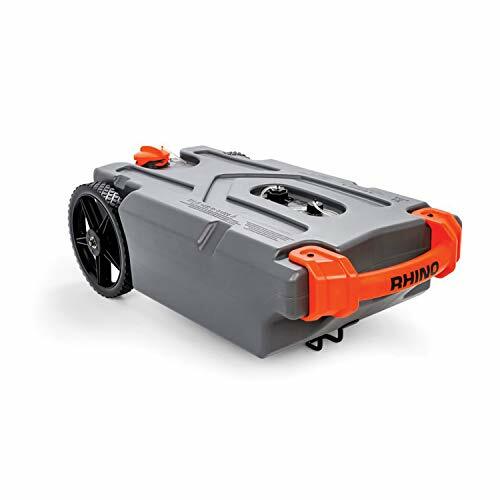 The Camco Rhino comes with a two-year warranty. It’s made of blow-molded and UV-stabilized HDPE that doesn’t leak and won’t deteriorate in the elements. A 3-foot Rhino extreme hose, bayonet and lug fittings, a 15-inch water horse rinse adapter, and additional fittings are included. This portable travel toilet has a detachable 5.3-gallon waste holding tank. Side latches firmly secure the RV holding tank to the toilet and prevent any leaks. An additional slide valve acts as a seal and helps stave off odors and leaks. This portable toilet is 15.5 inches high, 14 inches wide and 16 inches deep. It’s a compact option for your portable toilet needs and comes equipped with a bellows-style flush. A limited 1-year warranty is included. Well suited to all your traveling needs, this portable toilet can be used while camping, RVing, boating, or on other recreational outings. Camco’s TST biodegradable chemicals come with this product. Integrated handles make it easy to both move and empty. Weighing in at about 11 pounds when empty, and just over 30 pounds when full, this unit is lightweight and easy to travel with. Constructed from a heavy-duty polyethylene material, it’s able to accommodate up to 330 pounds despite its small footprint and minimal weight. If you’re looking for a great basic portable toilet, this Camco kit is worth considering. The 5-gallon bucket toilet comes equipped with a traditional toilet seat lid. The lid has a secure, latch-close mechanism to prevent any leaks should it be accidentally knocked over. It also works to cut down on odors. 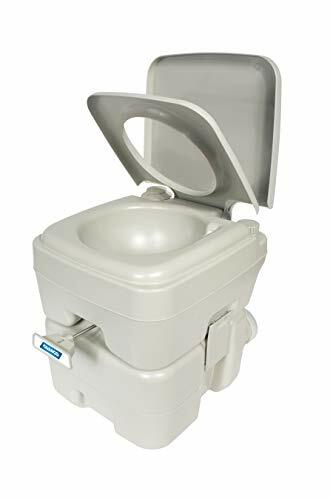 The Camco bucket toilet is easy to clean and transport and comes with a handle for carrying. Made of polypropylene, this durable bucket is also UV-resistant. It’s a great option for remote recreational activities, where you won’t have access to a toilet. Weighing only 4 pounds when empty, this is a lightweight portable toilet solution. It’s a breeze to use and portable waste transport bags that are available to make cleaning simple. Looking for a primary toilet option? Or do you just want to have a backup on hand? 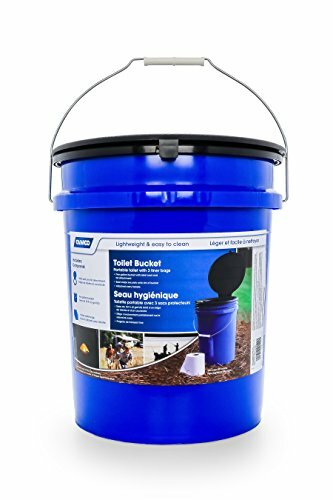 Either way, this portable toilet bucket fits the bill. What Is a Portable Waste Tank? 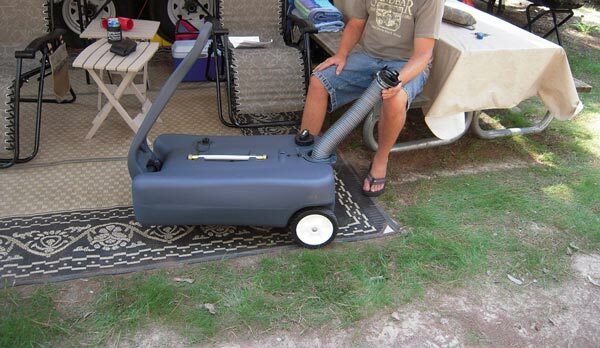 If you spend time camping or RVing, chances are you could use a portable waste tank. 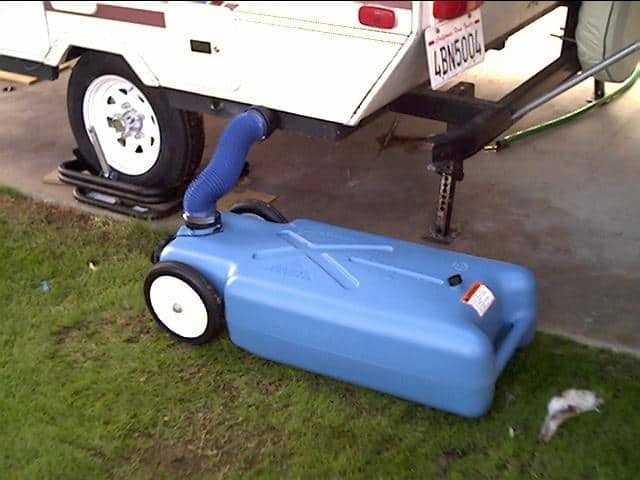 A waste tank is designed to move waste water from your RV or campsite to a designated dump station site. Portable waste tanks usually come equipped with drain connections, fill hoses, hose clamps, and wheels for easy transport. Some portable RV toilets may require access to your gray water or black water tanks. Bobber gauges may be included to help keep track of how full your RV waste tote is. Before you make a portable waste tank purchase, here are a few things you’ll want to keep in mind. You may think the larger the capacity of your portable toilet, the better. However, the larger the capacity is, the more likely it is to be heavy or difficult to empty. Plus, you’ll want to avoid leaving a full tank of waste sitting around for long periods of time. Doing so can mean nasty odors. Take into account the kinds of places you’ll be taking your portable toilet and how many people will be using it to best determine your capacity needs. The more your portable toilet can hold, the more important portability will be to you. Having a towable unit means you’ll be able to easily get your full toilet to a designated dump site. Rubber wheels can be a great help with maneuverability. The same is true for pneumatic wheels. Portable toilets are available at all price points. Determine exactly what you’re willing to spend to help narrow down your choices. Not every unit comes with a warranty. If yours does, make sure you know exactly what the warranty covers. If you plan on using your portable toilet frequently, investing in a warrantied product may be beneficial to you. Portable toilets can be incredibly easy to use and maintain. They can also be quite complicated with necessary chemical treatments and hose attachments. Determine exactly how much effort you’re willing to put into dealing with RV waste disposal prior to purchasing. Flush frequently. Keeping your toilet primed with water can help you avoid those clogs. Avoid using excessive toilet paper. If large quantities of toilet paper are needed, make sure to flush in intervals instead of all at once. Always flush twice. This runs more water through the system and helps ensure you won’t experience a blockage. Keeping your portable tank clean and sanitized is going to be of the utmost importance. By its nature, your portable tank will be handled, and soiled, often. Using sanitizing chemicals keeps your tank clean and you healthy. Many RV toilets are made out of plastics and have rubber sealing elements. It’s very important to keep this in mind when selecting your cleaning products. Choose only RV toilet cleaners for your waste system to ensure you don’t damage your toilet or the seals. In addition to keeping the toilet bowl clean, you should consider adding a cleaner to your black water tank. This will help prevent any buildup that can compromise the accuracy of your gauge readers.